The Lovie Awards, presented by the International Academy of Digital Arts and Sciences (IADAS), is the most prestigious honour in Europe for digital excellence. One Shoe developed -together with the development team of DHL Parcel- the intuitive digital B2X solution My DHL Parcel that merges a large amount of existing DHL-products in just one shipping service. The result is a very user friendly web application based on the latest technology for sending large amounts of commercial shipments. Help One Shoe win EU Internet’s top honour! 2. The People’s Lovie Award, voted on by the online public. As a finalist, we are eligible to win a People’s Lovie Award, which is voted online by people across the globe. Therefore we need as much votes as possible. 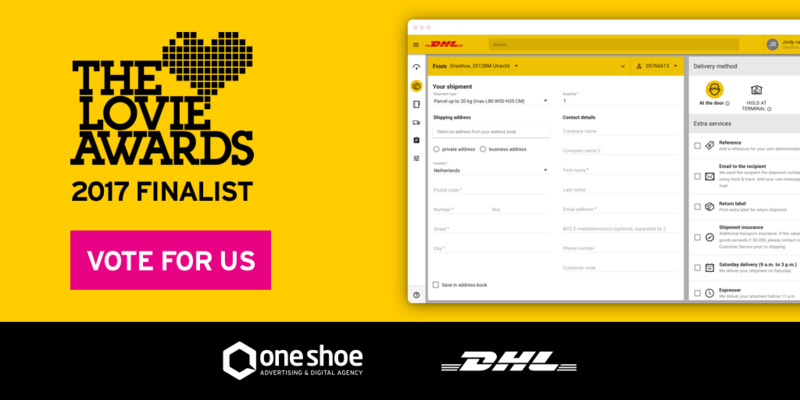 Cast your vote for My DHL Parcel in both categories to help One Shoe win a Lovie Award! All Winners will be honoured at the 7th Annual Lovie Awards ceremony at Picturehouse Central in London on 16 November 2017.